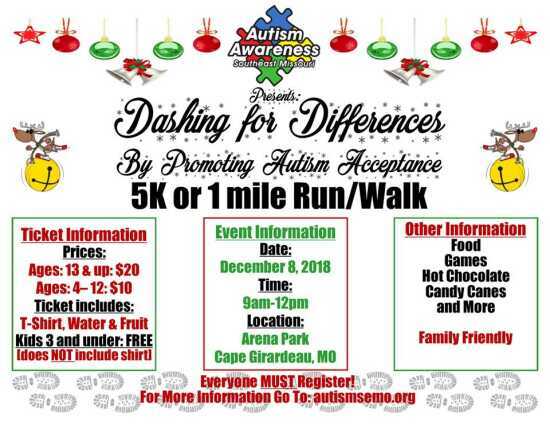 Austism Awareness of Southeast Missouri will hold the first annual Dashing for Differences by Promoting Autism Acceptance 5k or 1 mile Run/Walk on December 8, 2018. The event will open registration at 9 a.m. Race starts at 10:30 a.m. After Party at 11:30 a.m. This event will be held at Arena Park in Cape Girardeau. Tickets include t-shirt, water and fruit. This event is family friendly and will include games, hot chocolate, candy canes and more. Food will be available for purchase.